I haven't had the chance to try out many products from Clarins until recently when I recieved this set and I have been really enjoying trying out the different products. This set is such a bargain so if you will be going through the airport soon, make sure you head into World Duty Free to find this mega deal set! This is the Perfect Beauty Essentials Travel Exclusive Set which includes five products from Clarins and one of them is actually a full size which is amazing as it makes this set even better value for money! I like that Clarins have inclued a mixture of skincare items and makeup as it is a great way to be introduced to the brand at a lower price. All of the five products come complete in a clear zip up bag which actually complies with the airport requirements so I am definiely gong to keep this to keep my makeup in for my hand luggage as I believe I am going to be going on holiday soon - how exciting! The skincare items included in the set are the Instant Eye Make-Up Remover and the Gentle Foaming Cleanser. The eye makeup remover is very gentle on the skin and doesn't irritate my eyes in the slightest. It does a brilliant job at removing all traces of my eye makeup which I am so impressed with as I wear a lot of mascara! I am very fussy with my cleansers but I have been loving the cleanser included in this travel set which is suitable for normal to combination skin.This cleanser is great to use in the morning or evening to make sure that all traces of impurties have been removed while softening and nourishes the skin. 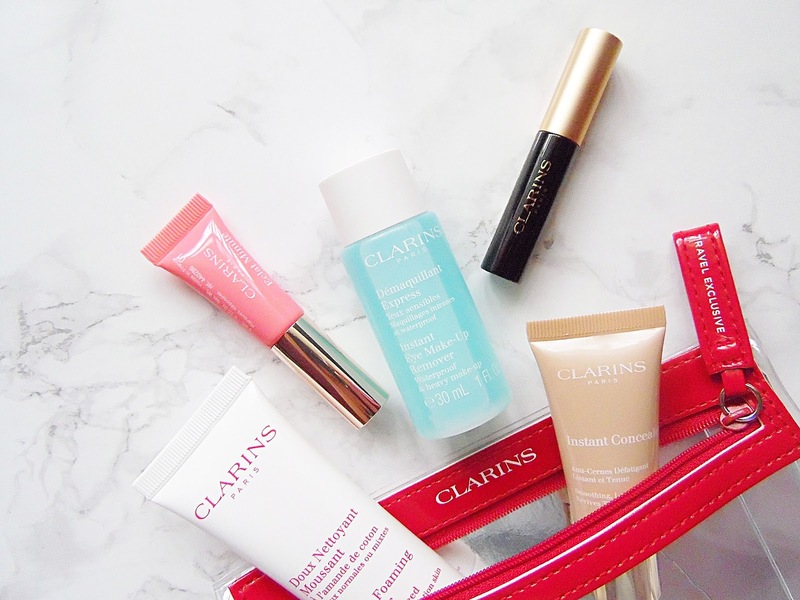 I will definiely try out some more skincare from Clarins now as I have been really impressed with how well these products remove makeup and make my skin super clean. There are three makeup items included in the set which are perfect to be used on holiday for those no makeup days when you just want to look a little more awake without wearing a full face of makeup. The Instant Light Natural Lip Perfector in 01 is one of my favourite lip products so I am so happy to have a mini size, the perfect handbag size! This makes my lips look glossy and fuller while keeping the lips hydrated. Another miniature is the Be Long Mascara. This mascara is incredibly lenghtening and I can't get enough of it as I love super long lashes! The final product in this set is the Instant Concealer in 02 which is a full size product! This is the perfect shade for when I have a tan and is great to brighten the under eyes while feeling lightweight on the skin and smoothing the appearance of my under eyes. The Clarins Perfect Beauty Essentials Travel Exclusive Set retails for £25 and is available at World Duty Free - HERE. This post contains a press sample, all opinion are my own.